The Class Struggle in Latin America: Making History Today analyses the political and economic dynamics of development in Latin America through the lens of class struggle. 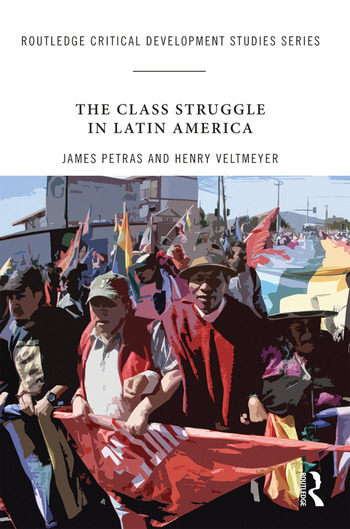 Focusing in particular on Peru, Paraguay, Chile, Colombia, Argentina, Brazil and Venezuela, the book identifies how the shifts and changing dynamics of the class struggle have impacted on the rise, demise and resurgence of neo-liberal regimes in Latin America. This innovative book offers a unique perspective on the evolving dynamics of class struggle, engaging both the destructive forces of capitalist development and those seeking to consolidate the system and preserve the status quo, alongside the efforts of popular resistance concerned with the destructive ravages of capitalism on humankind, society and the global environment. Using theoretical observations based on empirical and historical case studies, this book argues that the class struggle remains intrinsically linked to the march of capitalist development. At a time when post-neo-liberal regimes in Latin America are faltering, this supplementary text provides a guide to the economic and political dynamics of capitalist development in the region, which will be invaluable to students and researchers of international development, anthropology and sociology, as well as those with an interest in Latin American politics and development. Henry Veltmeyer is Professor of development studies at the Universidad Autónoma de Zacatecas (UAZ), Mexico, and Professor Emeritus of international development studies at Saint Mary’s University (Halifax, Canada). He is the author or editor of over 40 books on issues of Latin American and global development, and critical development studies. James Petras is Professor Emeritus of sociology at Binghamton University in New York, and Adjunct Professor in international development studies at Saint Mary’s University (Halifax, Canada). He is the author of over 60 books and numerous other writings on issues of world and Latin American developments.